Sola Sisters: Jonathan Cahn's Own Mars Hill? Jonathan Cahn's Own Mars Hill? There is an unlikely book taking the Christian world by storm right now (unlikely because there seem to be obvious problems with it) and yet this book, surprisingly, has been embraced by a a number of evangelical Christians. 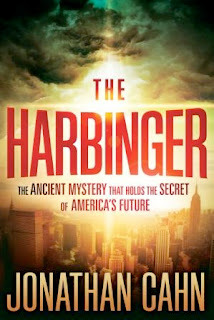 The book is The Harbinger, and it was written by Jonathan Cahn, a Messianic Jew who is also the senior pastor of the Jerusalem Center/ Beth Israel in Wayne, NJ. In our original Commentary on The Harbinger, we noted that The Harbinger is a fiction book, and features a character known as the prophet who is slowly giving seals to one of the main characters (Nouriel). These seals contain messages (nine in all) which are meant to be put together as clues in a mystery, so that a final, distinct message will emerge and be revealed. This message, once decoded, is intimated to hold the secret to bringing America back to its moral center and becoming once again a Godly nation. And in our original article, we discussed some of our concerns with the book, chiefly that, (1) in our opinion, the book has a distinct gnostic flavor to it, with its "mysteries" needing to be decoded, and also that (2) Jonathan Cahn's two appearances on Mormon Glenn Beck's show to discuss spiritual matters were problematic because Glenn Beck is not a Bible-believing Christian, and so his view of God and Cahn's view of God are vastly different, and such an alliance is likely to be very confusing, in general, to the body of Christ. "If I am given an invitation to go on an interview show, and I am given an open platform to share the gospel, to share the word of God, to share the warning and the call to repentance, I will do that. In no way, shape or form is going on an interview show, are you giving consent that you agree with the host's position or they agree with your position. And so they're giving an open platform........If I spoke to some of these people in these discernment ministries, and said, there's a man who's actually going to a pagan place, where it's all pagan, a pagan event, and he's going to speak, they would condemn him or crucify him, most likely. And they'd be crucifying the Apostle Paul on Mars Hill. And because he went there, it didn't mean that he was agreeing with Mars Hill." This is the second interview that I know of in which Cahn has likened his appearance on the Glenn Beck show to that of the Apostle Paul on Mars Hill addressing their "Unknown God." But in my opinion, that is an incorrect characterization of Cahn's Glenn Beck appearance. Did Jonathan Cahn Use His Appearance on The Glenn Beck Show To Give The Gospel Message? The Apostle Paul clearly gave the gospel message on Mars Hill, while, by all appearances, Cahn went on Glenn Beck's show to promote his book (The Harbinger), and did not proclaim the gospel. If you read the passage from Acts (below), and contrast it to what Cahn discussed on Beck's show (1st interview here, 2nd interview here), you simply cannot find anything in either of Cahn's appearances where he clearly proclaimed that Glenn Beck, as a Mormon, has given his allegiance to a false god, and is himself, personally, in danger of judgment, and that he needs to repent and place his faith in Christ alone for the forgiveness of sins. - A sovereign creator God who is holy, who made us and who has a righteous claim on our lives. - Man's depravity and inability to save himself. - Man's attempt to conjure up his own path to God with his all-bases-covered "Unknown God," and Paul then proclaiming that this God, who is "unknown" to them is real, that He commands all men to repent, and has Himself appointed a Man by whom salvation comes, and as proof of this, has raised this Man from the dead (all of which probably drove those sophisticated, religious pagans bonkers in the same way that it drives sophisticated, liberal Christians of today bonkers when people take the Bible literally....but I digress). So my lingering question is this: Going by the biblical text from Acts above, and comparing that to Jonathan Cahn's Glenn Beck appearances (here and here), does it appear that Jonathan Cahn took the opportunity, as he claims he did, to present the gospel message on the Glenn Beck show? 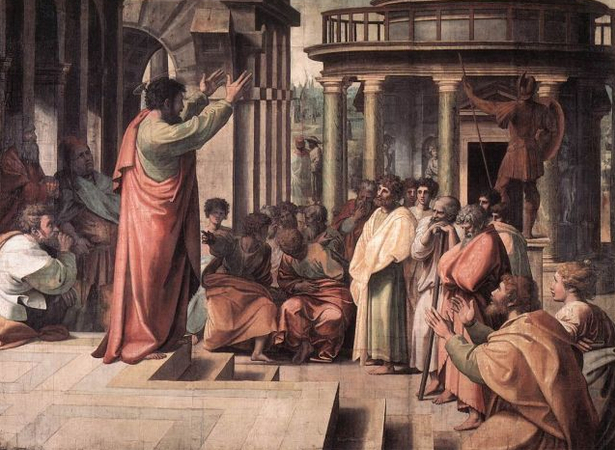 Do we hear anything of God's holiness? man's depravity? a command to repent and believe on the Jesus of the Bible, who bodily rose from the dead, for the forgiveness of sins? I just don't see it. But beyond just taking apart what he said he did vs. what he actually did, would it be stating the super obvious for me to wonder, also, where is Jonathan Cahn's pastorly care and compassion for Glenn Beck as a lost human being on his way to Hell? I'm rather neutral on the subject of Glenn Beck, other than finding him pretty amusing, but on the subject of Hell, I am not neutral. The thing about Jonathan Cahn's interview with Beck that is the most upsetting to me is that Glenn Beck has a soul, having been made in the image of God, and I'm left wondering this: how will Glenn Beck feel when he wakes up in hell, and thinks, wait a second, I was just twelve inches away from a Christian pastor who sat there and nodded when I talked about "God" and never told me that my Mormon god was a false god? Glenn Beck is lost-lost-lost, and he needs to hear that the times of ignorance have been overlooked by God, but that He now commands all men everywhere to repent (and that includes sincere, well-intentioned Mormons, like Glenn Beck). Just Eat The Good Food?